2019 Night Out To Help Out was a Success! Thank you everyone for a great Night Out to Help Out. County Executive Steuart Pittman provided us with some insights on what is happening at the County with an eye on Crofton area issues. State Senator Ed Reilly did a great job as our live auction barker ... a natural! 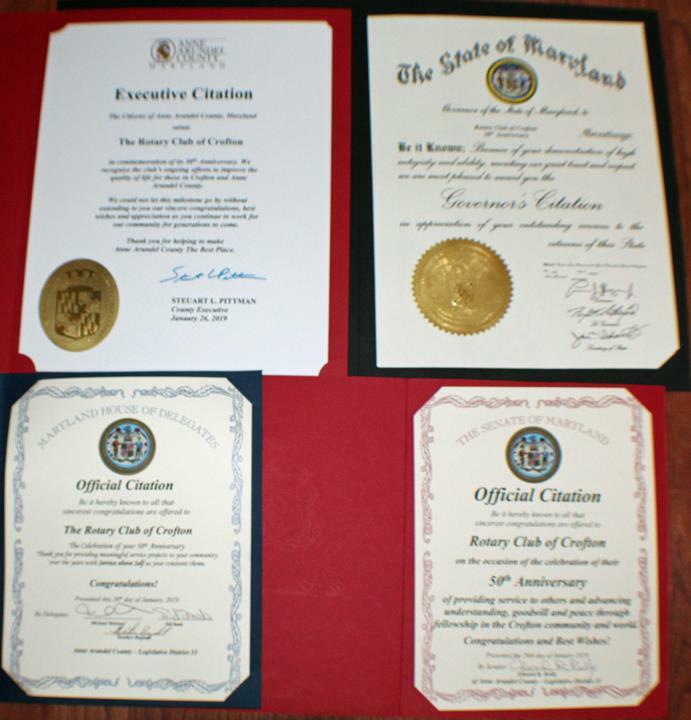 Thank you to Governor Hogan, Executive Pittman, the Maryland Senate and the Arundel County Delegates for honoring and recognizing all the the Crofton Rotary Club has done for 50 years (50 years!!). Everyone was moved by introductions to local groups such as Sarah's House, The Complete Player Charity, Kindness Grows Here and The Johns Hopkins House. A special thank you to our host, Brian McCann of the Blue Dolphin for all he has done to support Crofton area charities and civic organizations. Brian was awarded the Service Above Self award by Rotary with representatives of the Crofton Kiwanis Club and The Complete Player Charity. It was a great night! 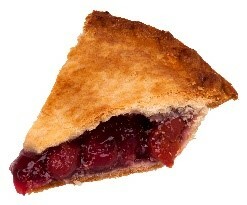 Are You Ready for Some Pie! 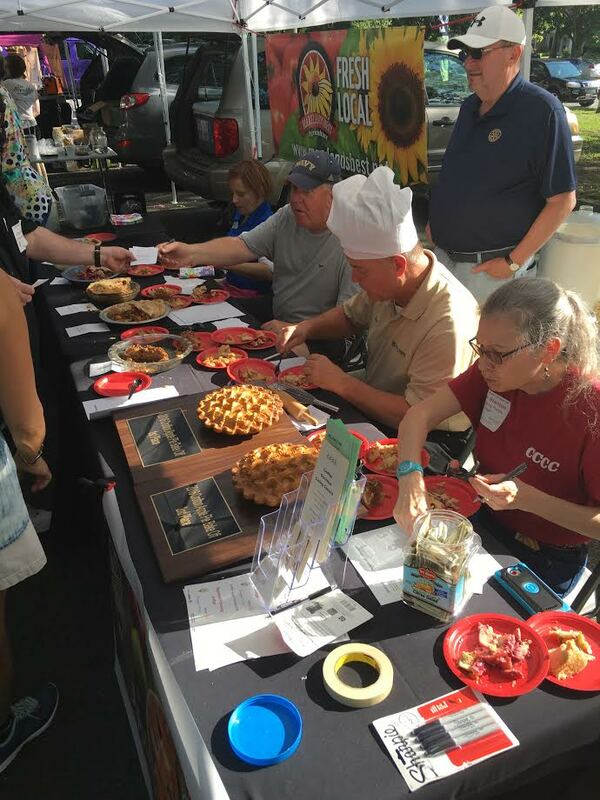 Pies will be judged by our esteemed panel of judges at 5:45 p.m., and awards will be made at 6:45 p.m. Contestants are asked to bring a minimum of two pies and slices will be sold to the public to benefit the Crofton Christian Caring Council’s Baby Pantry. Attendees can purchase a piece of pie for $5 or bring a new diapers, baby formula or wipes in exchange for a piece of pie. The CCCC’s Baby Pantry provides baby food, diapers, wipes and other baby care supplies to mothers who need assistance. Contestants should reserve their place in the contest by registering at https://croftonchamber.com/events. We suggest registering early, but please register no later than June 10th. A variety of local politicians and candidates will also be there to raise money (eight so far!) Each will be asking for donations that will be split 50/50 between Anne Arundel County’s retooled Drug Abuse Resistance Education (D.A.R.E.) program and the CCCC’s Baby Pantry. Whomever collects the second most money gets to pie the face of whomever collects the most money at the close of the program (right after award are announced.) You don’t want to miss this! You may have noticed the Flags for Heroes display is back up for Memorial Day Weekend, the flags will also be displayed around the 4th of July as well. Crofton Rotary, Crofton Kiwanis, and the Arundel Volunteer Fire Department are joining together to organize a special recognition of Veterans and First Responders from November 3rd through November 17th, 2018 called Flags for Heroes. This program is for Veterans Day, but early sign-ups can order flags in time for the 4th of July display. (It takes two weeks to process the orders). Visit https://www.croftoncommunity.org/so/aMEOdazE?cid=4f90c90c-2c4e-4aaf-9def-4d93315122a7&region=#/main to download a flag sponsorship form or visit www.eventbrite.com to pay by credit card. Any questions can be sent to Croftonrotary@gmail.com. The Crofton Rotary Club hosted a year-end party for the members of the South River High School Interact Club at Crofton Go Kart Raceway. Chick Fil-A provided a lot of chicken nuggets, drinks and chocolate chip cookies and the students had one hour of unlimited race time on the the go karts. Thank you Crofton Go Kart Raceway and Chik Fil-A! Crofton Rotary President Jim Harvey presented Katie Sullivan with a certificate and check for $1,000 for her first place finish in this year's Scholarship Competition. Crofton Rotary President Cliff Oliver presented Helen Dover with a $500 check and certificate for finishing in second place. The club also send an honorable mention certificate to Caleb Cobb. Congratulations to all the scholarship winners and participants, every application was excellent and selection by the Scholarship Committee was difficult. Congratulations also to the SRHS Interact Club graduating seniors as well! 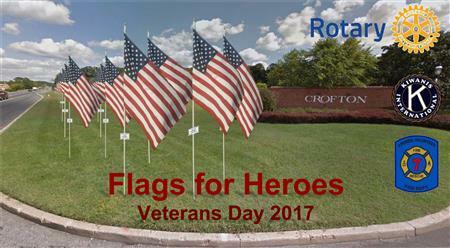 Join the Crofton Rotary, Crofton Kiwanis and Arundel Volunteer Fire Department for this special Flags for Heroes dedication ceremony at the Crofton Village Green. Troop 731 will be providing an honor guard and following a moment of silence and a benediction, and word from WWII and Korean War Veteran John Walker, local dignitaries will read aloud the names of the many veteran, servicemen and first responders honored in the Crofton Flags or Heroes display along Route 3 at Lake Louise. Mission BBQ is providing food for the event as well. Bring a lawn chair to the event. Join us on Wednesday, October 25th from 4:00 PM to 6:00 PM for Third Annual Crofton Chili Cook-Off at the Crofton Farmers Market at the Crofton Country Club. Bring a packaged food item or make a $5 donation and you get to try each of chili from our local contestants and submit your ballot for the "People's Choice" award. All proceeds will go to the Crofton Christian Caring Council's Baby Pantry. July 26th is the second annual Crofton BBQ Cook Off and we are looking for contestants! The even benefits the Crofton Christian Caring Council. See http://croftonfarmersmarket.com/bbq-cook-off/ for details and registration. 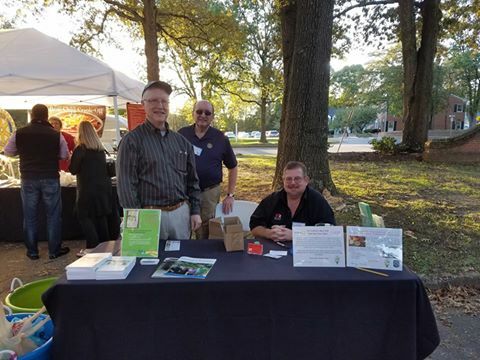 The Crofton Rotary Club held three fundraising events in conjunction with the Crofton Farmer's Market this past summer and fall. The Apple Pie Bake-off, the BBQ Cook-Off and the Chili Cook-Off raised funds for the Food Bank run by the Crofton Christian Caring Council. Many thanks to our participants, volunteer judges and to the Crofton Farmer's Market for making these events a success! Members of the Crofton Rotary Club were joined by students from the Interact Club of South River High School in providing a complete picnic dinner along with entertainment for residents of Sarah's House. The two club's have made hosting this picnic an annual event. 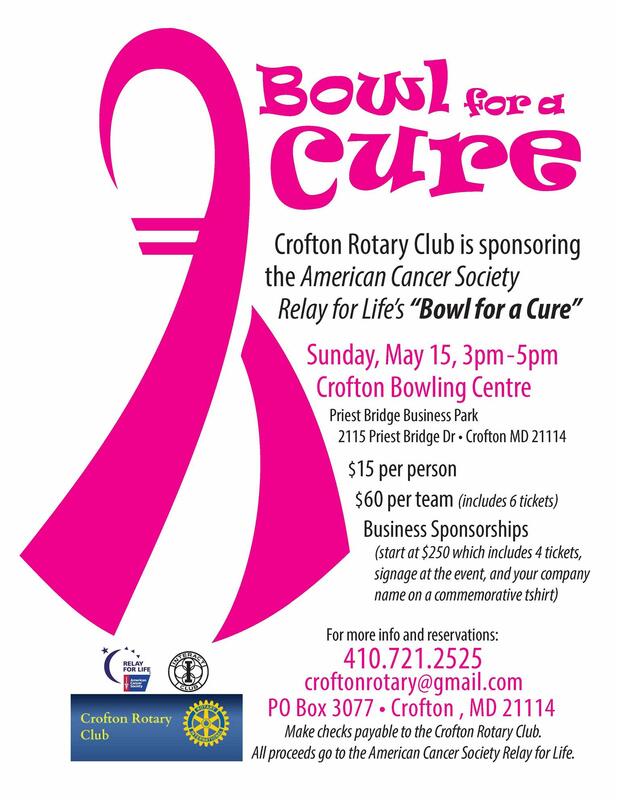 The Crofton Rotary Club, in partnership with the Interact Club of South River High School, is sponsoring the "Bowl For A Cure" Fundraiser at the Crofton Bowling Centre on Sunday May 15, 2016 from 3 - 5 pm. See the flier for details on sponsorship opportunities and tickets. Come out for some fun and help us raise money for our community service projects! 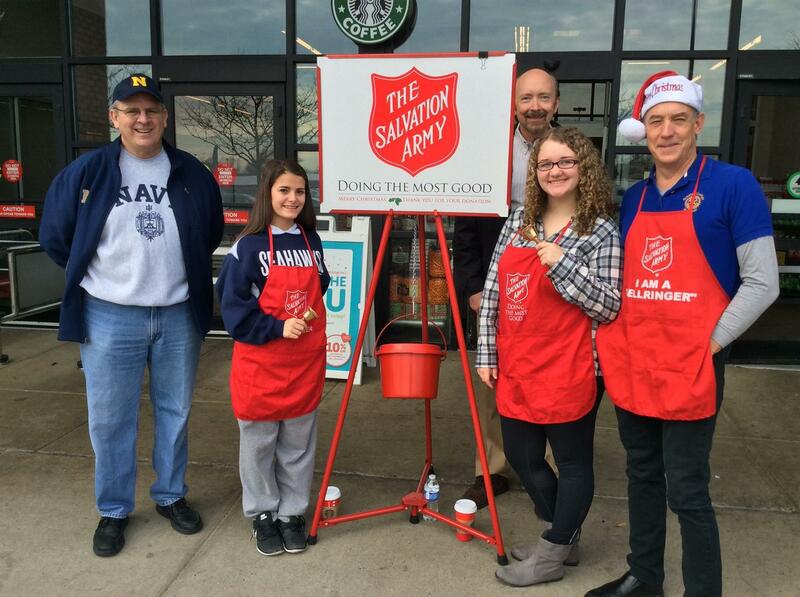 Members of the Crofton Rotary Club and students from the Interact Club of South River High School are ringing the bells at the Safeway at the Village of Waugh Chapel on Saturday December 13 and 19, 2015 to help raise money for the Salvation Army. The Crofton Rotary Club held it's annual Shoe Drive for the children of Sarah's House. Our members, friends and students from the South River High School Interact Club came out to help us purchase 54 pair of shoes for the kids at local businesses. The Rotary Club of Crofton has launched a new international project in conjunction with Rivers of the World Foundation, a Crofton-based non-profit organization. Nepal and Northern India have been plagued by natural disasters over the last two years. The Crofton Rotary Club is helping the Rivers of the World (ROW) Foundation (also a nonprofit organization) establish a safe drinking water and water testing school in Ghansali, India. Located at the headwaters of the Ganges River, this is the source of drinking water for millions of people, many of which are living in poverty. The Safe Drinking Water and Water Testing school is hosted by the Himalayan English School in India, ROW has provided the first of the testing kits, and a building has already been donated to the effort by a local guru. This effort will allow local folks to learn to test, identify and eliminate sources of pollution and will have a lasting effect for many years to come. Please help us in this effort by sharing the link to our fundraising effort ( https://www.youcaring.com/rotary-international-and-rivers-of-the-world-foundation-457191 ) on your personal and company Facebook pages, Linkedin page and website. While there, please consider making a donation to this effort; even if it's just a few dollars, your investment will go a long way to helping Rotary International reach its goal of making safe drinking water available to everyone. The members pictured (clockwise from the top) are Bob Hartman, John Hollywood, Tom Callahan, Gale Seaton, Rankin Lusby and Carole Lusby. The Crofton Rotary Club presented the American Cancer Society with a check for $3,500 during the Relay For Life event on June 6 at South River High School. This was a joint fundraising effort between the Crofton Rotary and the students of the Interact Club at South River HS and was held at the Crofton Bowling Centre on May 17, 2015. Crofton Rotary member Barry DesRoches was recently honored with the club's highest honor: "The Raymond E. Streib Rotarian of the Year Award". Barry served as the club's president for 2013-2014 and continues to play a lead role in the club's fundraising and service projects in the Crofton community. Pictured here are Barry(r), receiving the award from fellow Rotarian Tom Locke during a recent club meeting. During a short ceremony at the Club's Annual Gala on January 24, Crofton business owner Gary Heldt was inducted into the club as it's newest member. Pictured here are Gary Heldt (l), Crofton Rotarian Tom Hutcheson, who presided over the ceremony and Rotary District Governor Bill Fine (r). The Founding Director of the Crofton-based "Rivers of the World Foundation" charitable organization, Subijoy Dutta, was the speaker at this weeks Rotary meeting held at the Nautilus Diner. Rivers of the World was founded with the primary objective to make all efforts to cleanup highly polluted rivers in the US and internationally. Mr. Dutta was the keynote speaker at the recent Second International River Summit held in Markima City, Philippines. For more information visit: www.rowfoundation.org. The Crofton Rotary Club was pleased to induct it's newest member Jim Harvey during Tuesday's meeting. Tom Hutcheson (r) handled the induction ceremony which was witnessed by member Tom Callahan (l). Welcome aboard Jim! Rotary District Governor Bill Fine visited the Crofton Rotary Club Monthly Evening Meeting which was held at the Crofton Country Club on October 28, 2014. DG Fine gave an inspiring speech, addressing the membership and highlighting our club's many accomplishments over the past year and outlining the "Light-Up Rotary" international service campaign. This month's evening meeting of the Crofton Rotary Club was held at Houlihan's Restaurant and featured Jacob Landis an Annapolis resident who made headlines for his amazing 2013-2014 nationwide bicycle tour to 30 professional baseball parks known as "Jacobs Ride" to raise awareness and money for those with hearing loss. Jacob gave an incredibly moving talk about his early struggles with hearing loss and how he made raising awareness of the benefit of Cochlear implants his life's work. Jacob took us through his journey from the ride's inception, obtaining sponsors and funding, to how he overcame numerous obstacles on the road including being struck and badly injured by a semi-truck with only 180 miles left to complete his trek. Jacob returned from injury to successfully complete his ride in May 2014 and he raised national awareness for hearing loss in the process. If you want to learn more about his incredible cause, visit his website at www.jacobsride.com. Pictured here are (l to r) Club President Roger Morrison, Jacob Landis, and Wes Sherman, a Crofton Rotary member and lifelong Landis family friend. Crofton Rotarians staffed a Rotary table at the Festival on the Green this past Saturday and were joined by members of the South River High School Interact Club. Pictured here are Rotary members, family, friends and SRHS Interact members and faculty. Bob Grill, President of Disaster Aid USA and a member of the Historic Prince Georges County Rotary Club, joined us on September 16 for our Tuesday morning meeting. Disaster Aid USA is a Rotary Club Project administered by Rotarians, supported by Rotary Clubs, non-rotarian civic groups and church organizations. When disasters occur at home or away, Disaster Aid Response members respond with the solutions needs. Our local Rotary zone maintains a fully stocked relief trailer which is deployed as needed within our zone or throughout the US. Bob provided us a list of the items they need to maintain the trailer in a fully-stocked condition. Pictured here (l to r) are Club President Roger Morrison, Bob Grill, and Crofton Member Mike Ahearn. Our club recently hosted a Leadership Seminar for the incoming officers of the South River High School Interact Club. The event was held at the Crofton Bowling Centre Conference Room. The location was provided by Crofton Member Jim Gardiner and featured Leadership Training by Crofton Member Frank Newhard, who is a professional business coach. Our club is the proud sponsor of the SRHS Interact Club. Pictured on the far left is Crofton Rotary Member and Interact Committee Chair Rankin Lusby, and on the far right is Interact Faculty Advisor Wendy Pierre. 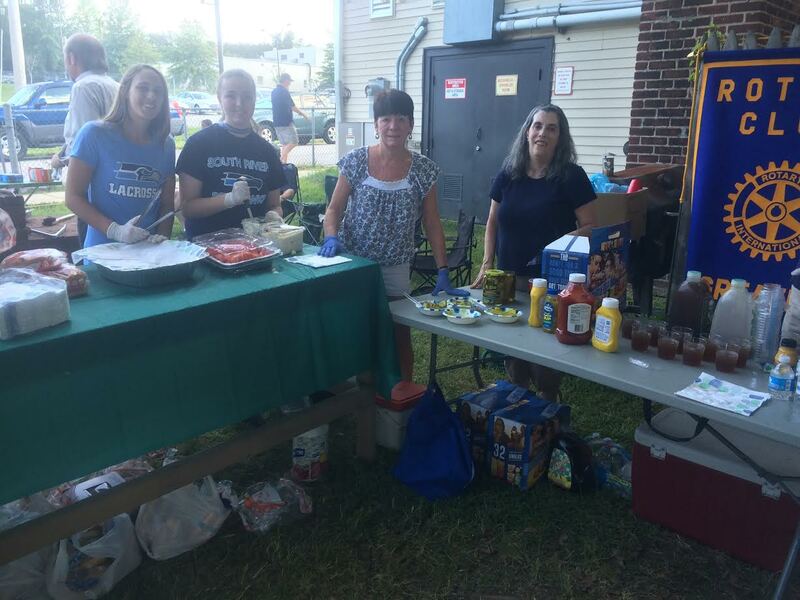 On Tuesday evening, the Crofton Rotary Club put on a picnic for the residents of Sarah's House in Fort Meade. Our members cooked for and served approximately 60 residents and entertained the kids with games and prizes. Many thanks to Sarah's House for affording us the privilege of providing the picnic for the residents. Special kudo's go to Peter and Liz McKibbin for spearheading this event for our club, and to the many members who put in their time, secured food donations and donated their own money to this event! Dr. Judd Howell, Acting Director of the Patuxent Wildlife Research Center, was the speaker at this weeks evening meeting of the Crofton Rotary Club held at the Blue Dolphin. Judd retired from the same position six years ago, but recently returned to serve as Acting Director. His presentation was entitled "Wildlife, Bureaucracy & the Beltway." Judd is also a member of the St. Helena's Rotary Club in the Napa Valley region of California. Many thanks to Judd for the outstanding presentation, which also included Judd donning an outfit used by researchers to teach Baby Crane Chicks how to feed. In a ceremony at today's weekly club meeting, Kevin Lally was inducted as the first new member in the new Rotary Year. Pictured below are (l to r) Club President Roger Morrison, Kevin Lally, and Tom Callahan, Treasurer. Kevin is the owner of All American Mattress, a local Crofton business. He was sponsored for membership by Tom Callahan. Members of the Rotary Club of Crofton were on hand to help the Crofton 50th Anniversary Committee with their Summerfest event on Saturday at the Crofton Country Club. Pictured here (l to r) are Club Members Cliff Oliver, Roger Morrison, Barry DesRoches and Rankin Lusby, who were just a few of the members who helped out. The Rotary Club of Crofton is pleased to honor Debbie Risher, owner of Belair Engineering, with a Presidents Citation for her contributions to the Club's 2013 Christmas Family Project. Debbie was called upon last fall to help the club address a critical need for a local family. Without hesitation, Debbie and her staff at Belair Engineering responded, evaluated, and removed an inoperable HVAC system, then arranged to have a new unit donated and installed by Belair at no cost. The efforts of Debbie and her staff ensured a local family in need had a working heating system in time for this past brutal winter season. Pictured here are Debbie Risher (l) receiving the Presidents Citation from Club President Barry DesRoches. Lisa Vernon, Director of the Literacy Council of Anne Arudel County was presented the "Service Above Self Award" by the Rotary Club of Crofton during the Service Above Self Awards banquet held on Thursday evening May 22, 2014 at the Lowes Annapolis Hotel. Lisa was among four honorees nominated to receive the award by each of the Annapolis Area Rotary Clubs. 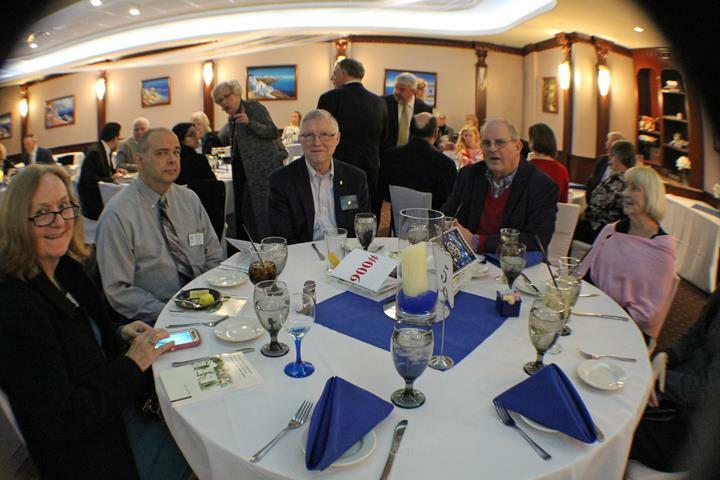 The event was attended by Rotary District Governor Peter Kyle as well as members of the Crofton, Annapolis, South Anne Arundel County, Parole and Annapolis Evening Rotary Clubs. Pictured here are (l to r) Club Secretary Liz McKibbin, Lisa Vernon, and President-Elect Roger Morrison. Crofton Rotarian completes the Warrior Dash to help End Polio Now! Crofton Rotarian Peter McKibbin recently completed the Warrior Dash, raising money for the Rotary International End Polio Now campaign. Peter was cheered on at the event by his wife Liz who is also a Crofton Rotarian, his friends and family! Congratulations Peter! On May 9 to 11, 2014 the District 7620 Conference was held at the Baltimore Hilton Hotel. 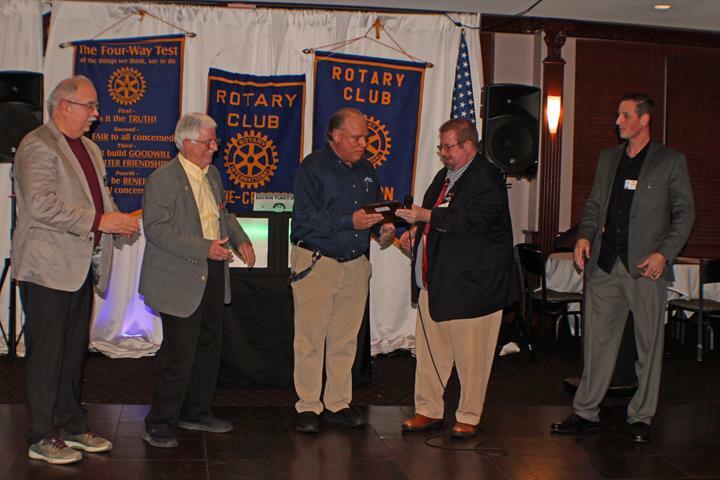 Several Crofton Rotary members participated and our own Rankin Lusby was recognized for 54 years of Rotary Service! Here are a few shots from the conference. During the recent Rotary District 7620 Conference in Baltimore, our Club was honored to recieve a Gold Award along with a Presidential Citation with Distinction. President Barry DesRoches received the award from District Governor Peter Kyle and Past Rotary International President Bill Boyd. On Saturday May 3, members of the Crofton Rotary participated with the Crofton Village Garden Club in a gardening and beautification project at the Crofton Library. 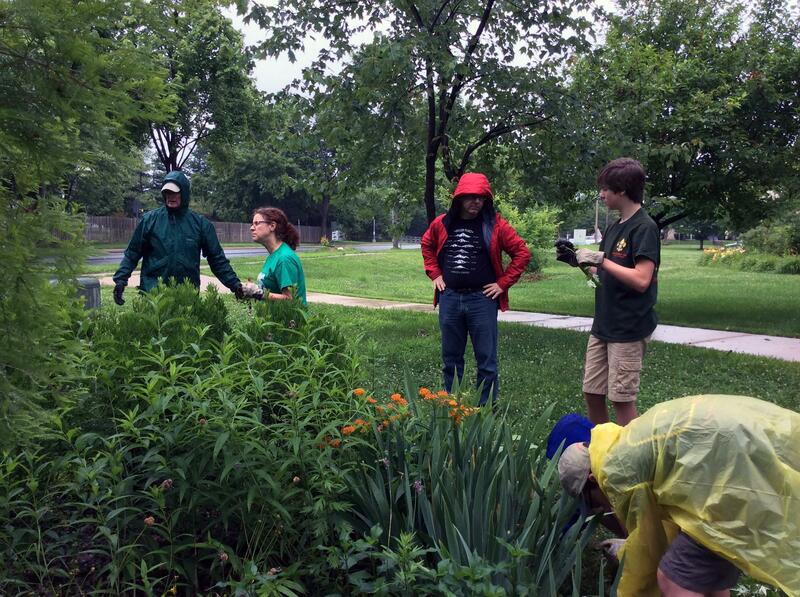 Members hauled mulch, pulled weeds, edged and raked a section of the gardens along Klocko Way. 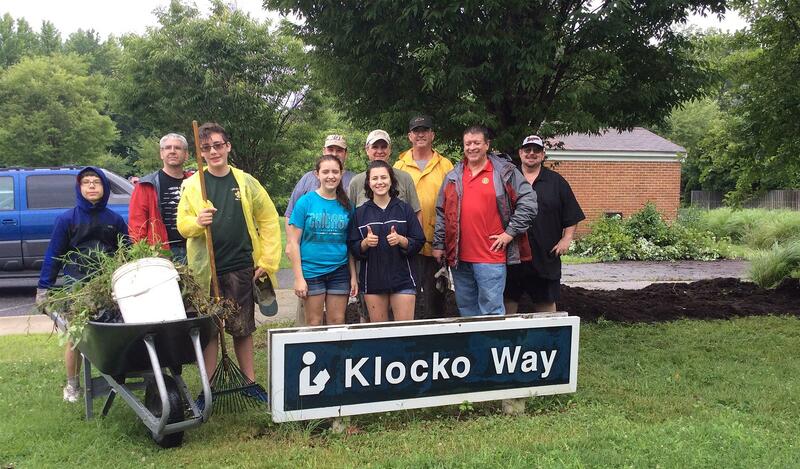 Pictured here are members and friends of the Crofton Rotary who helped out on Saturday. 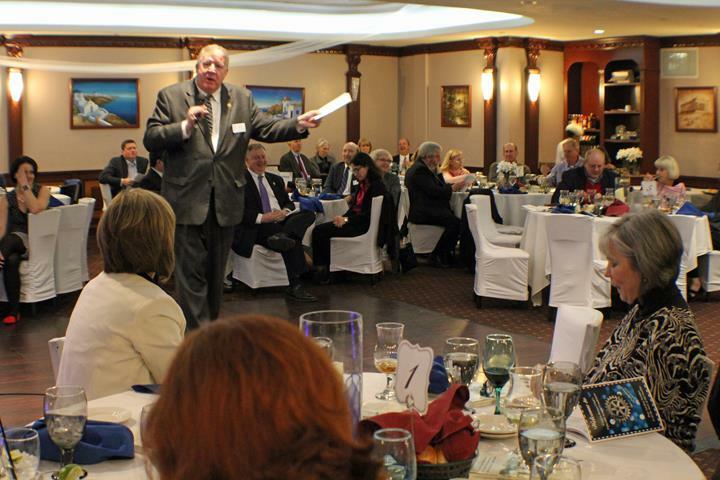 Our Club held it's 10th Annual Fundraiser Gala at the Blue Dolphin on Saturday evening January 25, 2014. During the ceremonies, we were proud to honor Lisa Vernon, Director of the Literacy Council of Anne Arundel County for "Service Above Self" to the community. Pictured here (l to r) are club members Roger Morrison, Frank Newhard, Honoree Lisa Vernon and Club President Barry DesRoches. Many thanks to our members, supporters and guests who came out in record numbers to support the club's charitable efforts in our community! Our club was honored to have representatives from the Crofton Athletic Council speak at our meeting this week. John Wagner (l) and Rick Gloekler (r), pictured here with Club President Barry DesRoches, provided an overview of how the council annually supports approximately 16 different sports with over 2,000 families signing up to participate. The Council is one of the strongest recreation programs in the county. The Crofton Rotary Club is a proud supporter of the Crofton Athletic Council and all they do for the Crofton Community. The Crofton Rotary and South River High School Interact Club teamed up on this years Shoe Drive to benefit Sarah's House. The team purchased 76 pair of shoes and delivered them to Sarah's House last Saturday. Pictured here are members of the South River High School Interact Club along with their Advisor Wendy Pierre (2nd from the right) and Crofton Rotary Secretary Liz McKibbin (far right) who spearheaded the drive for our clubs this year. Our guest speaker at our November Monthly Evening meeting was Ross Swope, Chief of Police for the U.S. Supreme Court. Ross recounted his incredible law enforcement career with the DC police department and spoke of the challenges and satisfaction of his present position. Thanks again Ross! Our guest speaker at Tuesday's meeting was CDR Peter LeHardy (ret), USNA '89 graduate. Peter works for Phoenix International, a company which provides underwater solutions worldwide. He gave an informative presentation on commercial diving, underwater vehicles, and the latest technologies used by the US Navy for search and salvage operations. Peter brought with him one of their underwater robots and explained how it operates. Pictured here (l to r) are Rotary members Mike Mullins, Roger Morrison, President Barry DesRoches, CDR Lehardy, Peter Mckibbin and Tom Callahan. Crofton Rotary Club Dictionary Distribution is a record-setter! On Tuesday and Wednesday September 10 and 11, 2013, members of the Rotary Club of Crofton distributed 505 dictionaries to Third Graders at five Crofton Elementary Schools. This was a record setting year for this annual event! At the Crofton Woods School, Principal John Barzal (r) is seen here addressing students along with Club President Barry DesRoches. Also pictured are Club Secretary Liz McKibbin addressing a third grade class at the Crofton Elementary School on Tuesday. The last photo is a few of the many club members who participated in the distribution this year. Hats-Off to Tom Callahan who coordinated the Distribution for the 7th year! Mary Dulaney, Development Director for Maryland Therapeutic Riding visited our club today and provided us with information about the mission and services provided by MTR which is located in Crownsville, MD. Mary also provided us with information about their fundraising event on Friday September 27, 2013 featuring Country Music Star Ricky Skaggs and The Hard Travelers. You can find out more about MTR along with details for the fundraiser at: www.MTRinc.org. Members who want to attend and need tickets, should see Barry Desroches who is selling them as well. We were pleased to have Pat Kasuda, member of the Rotary Council of Legislation and Chair of the District 7620 Endowment Program for Gallaudet University address our membership at our Tuesday morning meeting at the Nautilus Diner in Crofton. Seen here are Pat Kasuda along with Crofton Rotary President Barry DesRoches. Barry DesRoches became the new President of the Rotary Club of Crofton during a ceremony held at Allisons Restaurant in Crofton,MD on Wednesday evening. Pictured here are Barry DesRoches (l) along with Ray Streib, Past District Governor and member of the Rotary Club of Glen Burnie who officiated the installation. Also installed were the new team of Crofton Rotary officers for 2013-2014 which included new Club Secretary Elizabeth McKibbin, Treasurer Thomas Callahan and President-Elect for 2014-2015 Roger Morrison. Outgoing Club President Frank Newhard was honored for his outstanding service as President for 2012-2013. A large group of club members and their spouses along with county officials and honored guests were present for dinner and the ceremony. The Crofton Rotary Club joined up with the South River High School Interact Club recently to sponsor a fundraiser at the Crofton Bowling Centre. Seen here presenting a check to Nick Farano (l) of the American Cancer Society are Club President Frank Newhard along with Jim Gardiner. Jim is a Crofton Rotary Club member and partner in the Crofton Bowling Centre who, along with his great staff, did a wonderful job as event host and coordinator. 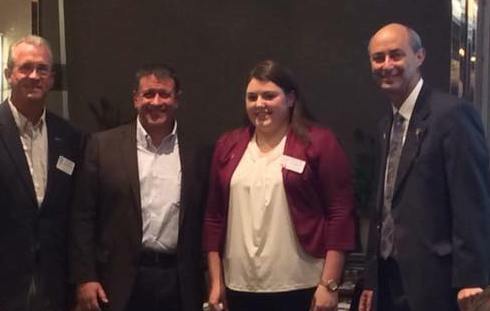 The Rotary Club of Crofton welcomed new members Samantha Bowen and David Williamson during Tuesday's meeting at the Bob Evan's Restaurant in Gambrills,MD. Pictured (l to r) are new member sponsor Joe Bowen, club member Tom Hutcheson, Samantha Bowen, David Williamson and Club President Frank Newhard. The Crofton Rotary Club welcomed Kathy Buscher and Peter McKibbin as new members during the May monthly evening meeting which was held at the Greene Turtle in Gambrills. Seen here are member Tom Hutcheson, who conducted the induction. along with Kathy Buscher, Club President Frank Newhard and Peter McKibbin. Lisa Vernon, Director of the Anne Arundel County Literacy Council, addressed our members at a recent meeting. Lisa gave an informative speech on the mission and history of AACLC which is a non-profit organization which provides reading assessments and tutoring services through 135 tutor/student matches in our county. Pictured here are Lisa along with club President Frank Newhard. District Governor-Elect Peter Kyle (pictured here on the left, with Kristen Lasker and Club President Frank Newhard), and Kristen Lasker, Director of Development and Marketing for ARC of the Central Chesapeake Region, paid a visit to the Crofton Rotary Club this morning. DG Elect Kyle addressed our members on the importance of the Rotary Foundation and the Rotary Matching Grants program. Kristen educated our members on the ARC mission and how they serve families in our community. You can learn more about ARC at www.thearcccr.org. The Crofton Rotary Club is the proud sponsor of the South River High School Interact Club. This morning, four members of Interact who attended the recent Rotary Youth Leadership Awards (RYLA) visited our club and gave us a briefing on their experience. Pictured here are Club President Frank Newhard and the four RYLA attendees. The Crofton Rotary Club honored South River High School Interact Club Officer Casey Thate and her brother Riley Thate with the Presidents Award for their work in producing the Crofton Rotary 2012 Gala Video. Shown here is Casey Thate along with Crofton Rotary Club President Frank Newhard. Casey and Riley voluntary took on the task of filming and editing the video which was presented during the club's 2012 main fundraising event. The video showcased the club's local and international charity work and well as the contributions made by members of the SRHS Interact Club which is sponsored by the Crofton Rotary Club. The Crofton Rotary Club said farewell to one of it's favorite members last night. Bill Sondervan is relocating to North Carolina where another lucky Rotary Club will be gaining a great member. Bill was a Past President and a very active member of the Crofton Rotary for many years. Presenting him with a special award are President Elect Barry DesRoches (l) and President Frank Newhard (r). 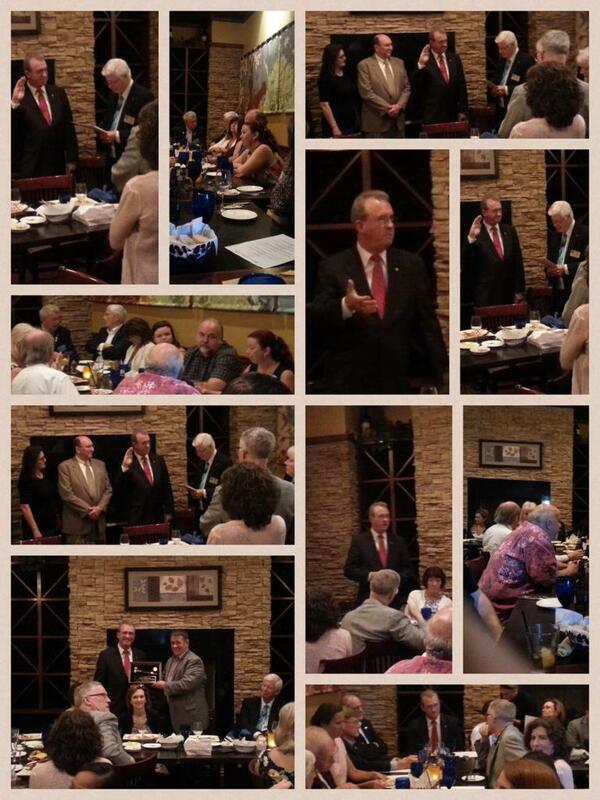 The presentation was made during the club's monthly evening meeting which was held at the Empire Garden Restaurant in Crofton,MD. 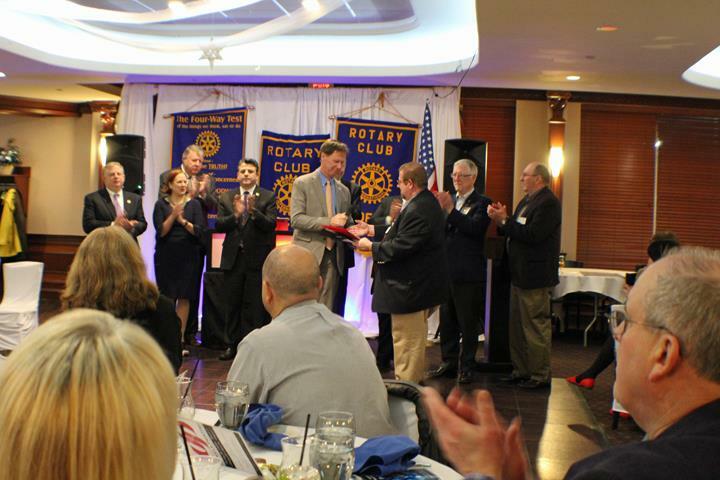 Mike Ahearn was sworn in as the Crofton Rotary Clubs newest member on Tuesday. Mike was previously a member of the Bladensburg Club. Pictured here are (l to r) member Tom Hutcheson, Mike Ahearn and Club President Frank Newhard. 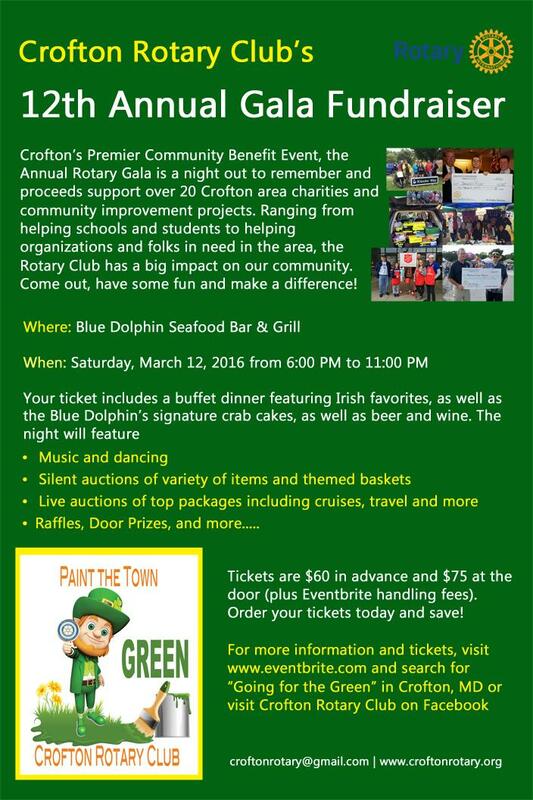 The Maryland Crime Victims Resource Center benefits from the Crofton Rotary Clubs Annual Fundraising Gala. Members of the Crofton Rotary Club presented a donation to the MCVRC at their monthy meeting in Cheverly, MD on Thursday evening. Pictured (l to r) are MCVRC Board member, Oliver Smith; Crofton Rotary Club Secretary, Roger Morrison; MCVRC Board members, Ricardo Wiggs & Dr. William Sondervan; Rotary Club President, Fred Newhart; MCVRC Board member, Dr. Debra Stanley; MCVRC Executive Director, Russell Butler; MCVRC Board Chair & Treasurer, Roberta & Vincent Roper; MCVRC Board member, Norman Workman. Crofton Rotary Club Members Ed White and Claudia McKibbin went on a recent shopping spree for shoes during the club's annual Shoe Donation to Sarah's House. On Saturday evening December 1, 2012, the Crofton Rotary Club held its 9th Annual Black and White fundraiser Gala at the Blue Dolphin Restaurant in Crofton. Those who attend enjoyed music, great food, entertainment and a silent auction which raised funds for the club's charitable work in the community. Thanks again to all the businesses and individuals who supported this event! The Maryland Fallen Heroes Motorcycle Ride held this past September raised $3,000 for the Maryland Fallen Heroes Memorial Fund. Seen here are Crofton Club member and Ride Coordinator Tom Locke (l), and Club President Frank Newhard (r), presenting a check to Crofton Police Department Sgt. Dave Muhl, representing the MD Fallen Heroes Memorial Fund. A great time was had by all at the Crofton Rotary Club's 9th Annual Gala held on Saturday evening December 1st at the Blue Dolphin Restaurant. Pictured here (l to r) are Bill Sondervan, President Frank Newhard and special guest Rodney Dangerfield (actually, it's member Mike Mullins who entertained the crowd with his impressions of the famous comedian). Joe Bowen has been named Crofton Rotary Club's Rotarian of the Year for 2012. Joe made significant contibutions of his time and resources which furthered the Rotary mission in the Crofton Community. He also sponsored more new members than any other member this year. Congratulations Joe! Crofton member Joe Bowen receives the Rotarian of The Year Award from Crofton Rotary Club President Frank Newhard during the Crofton Community Awards Banquet held at the Crofton Country Club. 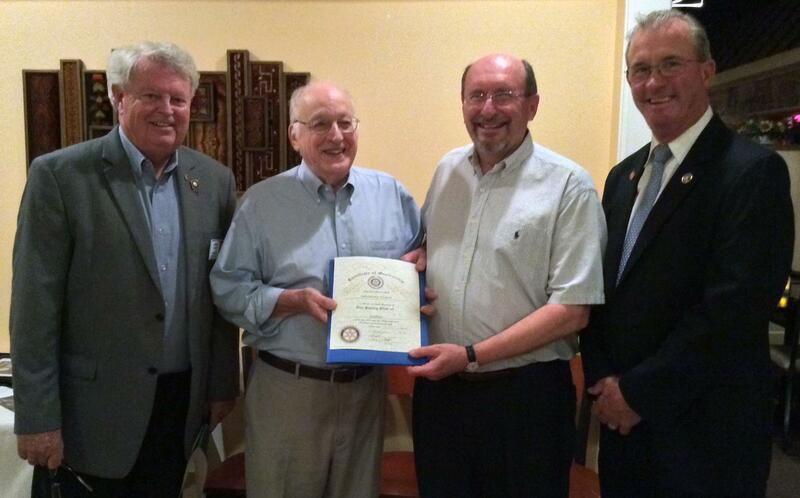 On Tuesday evening the Crofton Rotary Club inducted three Anne Arundel County leaders as Honorary Members. State Senator Ed Reilly, County Councilman Jerry Walker and Chief Clerk of Circuit Court Robert Duckworth are seen here during the induction ceremony conducted by Fellow Rotarian and Guest Speaker Ray Streib and witnessed by Club President Frank Newhard. The Crofton Rotary Club inducted Mike Mullins as our newest member. The induction ceremony was conducted by member Tom Hutcheson and was witnessed by District Governor Bob Parkinson, President Frank Newhard and the members of the Crofton Rotary Club. Welcome aboard Mike! Pictured here (l tor) are President Frank Newhard, DG Parkinson, Mike Mullins and Tom Hutcheson. We were honored to have DG Bob Parkinson visit us this morning at our meeting. Bob has a long and impressive record of service to our country and to Rotary. He gave an inspiring speech entitled "Peace Through Service". The DG also provided us with updates on what is happening at the district level and in the fight to eradicate Polio. Jim Mitcham of Kairos Prison Ministries, was the guest speaker at Tuesday's Crofton Rotary Club Meeting. Jim represents a network of approximately 30,000 volunteers who minister to inmates in prisons across the country. The groups goal is to reduce inmate recidivism. Club President Frank Newhard (l) presented Jim with a copy of a book on the history of Crofton. Crofton Rotary Club President Frank Newhard presented Bill Sondervan with the Gavel Award, commemorating his past year as club president. The presentation was made at the club's monthly evening social meeting at the Empire Garden Restaurant. 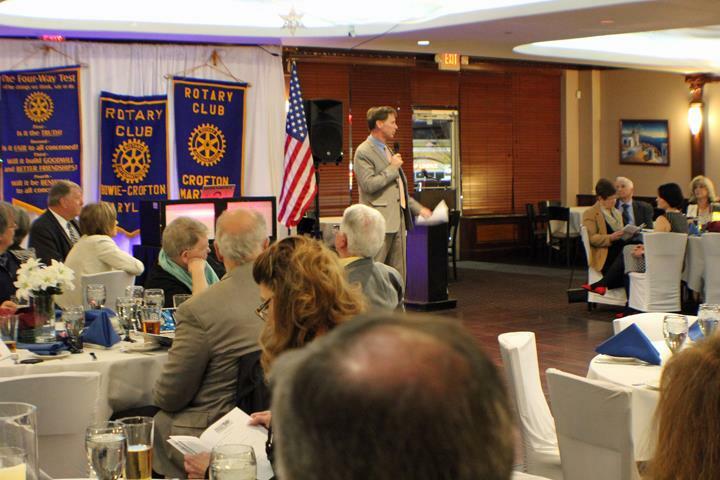 At last Tuesdays meeting of the Crofton Rotary Club, guest speaker Ron George, who is a member of the Ways and Means Committee, highlighted the problem of the continued exodus of businesses from Maryland, and the negative effect it is having on the state's tax base. Due to recent re-districting, Delegate George's District now includes Anne Arundel County. Pictured here are Ron George (l) receiving a copy of "From Sotweed to Suburbia, a History of Crofton,MD" from Club President Frank Newhard. The Rotary Club of Crofton held it's annual installation ceremony for new officers recently at the Four Seasons Grille in Gambrills. Pictured left to right are incoming President Frank Newhard, former Rotary District Governor Rich Carson and outgoing President Bill Sondervan. David Mitchell, Director of Public Safety and Chief of the University of Maryland Police Department was the guest speaker at Tuesday morning's meeting of the Rotary Club of Crofton. Chief Mitchell spoke about his 41 years in law enforcement, which included his time with the Prince Georges County Police Department, as Superintendent of the Maryland State Police and Director of Homeland Security for the State of Delaware. The Chief gave an informative talk about the unique challenges facing university police departments today. Crofton Rotary Club President Bill Sondervan presented a donation on behalf of the club to Andrea Sawyer of the Wounded Warrior Project. For over 20 years the Crofton Rotary Club has been there to support both our community and to act as an ambassador for the Crofton community, providing support to areas struck by compelling human need, locally and throughout the world. We need your help to continue these good works! On Saturday December 3rd the Crofton Rotary will host its 8th Annual Black and White Ball and Silent Auction at the Blue Dolphin in Gambrills. Tickets are $75 and all proceeds go to support our philanthropic efforts. On November 4th, 2011 during the Crofton Community Awards Banquet, Mr. Thomas Callahan was awarded the 'Raymond E. Streib' Rotarian of the Year award. Tom has been a dedicated member of the Crofton Rotary Club for over 10 years, he is the Club Treasurer and was the founding President and Charter Member of the Chamber of Commerce in 1989. He has been active and involved in civic and community affairs in Crofton for 35 years. We at the Crofton Rotary Club are honored to know Tom and work beside him in our service to the community and world-wide projects. This year, we are proud to present Tom with this award. Center for Applied Technology South gets new furniture!!! On November 3rd, 2011, the Crofton Rotary Club, headed by its dedicated member, Mr. Ed White, joined with the Anne Arundel County Food Bank to provide much needed furniture to the Center for Applied Technology South, in Edgewater. The Crofton Rotary Club selected, transported and delivered the furniture to the school, and they were thrilled to receive it. Suburban Scene Magazine has published an article, in its October edition, covering all of our Clubs projects and events. The entire article is included below. We would like to thank the Suburban Scene for this amazing article! The Crofton Rotary Club has had an amazing year, thanks to the support and dedication from our friends. We also recently received acknowledgment on some of our work within the Crofton community, from several different local newspapers, online blogs and friends. We are honored to have so many supporters, and continue to pledge our commitment to the Crofton community. Dictionaries to EVERY Crofton 3rd Grader!!! In honor of Literacy Week, on September 8, 2011 the Crofton Rotary Club will visit Crofton Elementary, Crofton Woods Elementary and Crofton Meadows Elementary schools and distribute a dictionary to every third grade student! This is an annual occurrence and the Crofton Rotary Club has been distributing dictionaries for the past 7 years. Crofton Chamber of Commerce and Crofton Rotary Club distribute Charity Golf Tournament proceeds to seven (7) local charities. Meet the new Crofton Rotary Club Board for 2011 to 2012!!! Tuesday, June 28 was the Crofton Rotary Club's Inauguration dinner to swear in our new President for 2011-2012 - Dr. William Sondervan. Along with our new President, the new Crofton Club Board Members were also sworn in; Thomas Callahan will serve as Treasurer and Claudia McKibbin will serve as Secretary and Frank Newhard will serve as 2012-2013 President-Elect. The dinner was held at the Big Fish Restaurant off of Route 3 at 6PM. Thank you to all our members, friends and families for their support. The evening was a great success!!! Every year the Crofton Rotary Club and the South River Interact Club take part in the Salvation Army Bell Ringing. This Holiday season we stood outside of Safeways in Waugh Chapel, Gambrills between 10AM and 4PM on December 11 and 18, to wish shoppers a "Happy Holiday!!" We wanted to thank everyone who donated and volunteered to help this worthy cause. Click here for Bell Ringing photos!!! Every Christmas the Crofton Rotary Club, with the help of the South River Interact Club, donates several pair of shoes to each family living at Sarah's House. This year we donated 40 pairs of men, women and childrens shoes. On March 29, 2011, the Crofton Rotary Club held an evening of fun and racing at the Go-Kart Raceway Track, in Crofton. The event was dedicated to the members of the South River High School Interact Club, and attended by both juniors and seniors. Interact is a Rotary service club for young people ages 12 to 18. Interact clubs are sponsored by individual Rotary clubs, which provide support and guidance, but they are self-governing and self-supporting. The Crofton Rotary Club is proud to be the sponsor the South Rover High School Interact Club. During the evening, Tom Locke, president of the Crofton Rotary Club, presented the seniors with Certificates, thanking them for all of the hard work and dedication that they have shown as members of Interact. These high school juniors and seniors have created and led projects that provided humanitarian service and promoted goodwill and understanding in the world. The evening was an absolute success! One Interact Club member even said “it was cool to do something you haven’t done since you were a kid”! For their hard work, developing leadership skills and individual responsibility the South River High School was the only Interact Club in the District 7620 to receive the “Rotary Presidential Citation for 2010”. The Crofton Rotary Club would like to extent a special thanks to the Go-Kart Raceway and Vocelli Pizza of Crofton for their much appreciated donations. Thank you to everyone that provided help to making this evening such an enjoyable occasion for everyone! 100% goes to local and international projects. Because we are all volunteers, there is no administration cost, so your entire donation goes to help those in need. We have contributed to local and international schools, volunteered as gardeners, bell ringers at Christmas and Mummies at Halloween! Crofton Club earns Gold Award!!! The Crofton Rotary Club has earned the Gold Award from our local District 7620, which will be presented to us at the District Conference, which will be April 29th - May 1, 2011 at the Turf Valley Country Club in Ellicott City, Maryland. The Crofton Rotary Club will also receive the Presidential Citation from Rotary International. Congratulations to all our members and supporters for a wonderful year; full of amazing projects both in the Crofton community and internationally! March 22nd is World Water Day!! World Water Day is approaching quickly. Consider planning a water or sanitation project in your club or district. Read more about World Water Day. Literacy Month is the ideal time to consider a literacy project in your community -- or across the globe. Let the materials in The Rotarian magazine’s Resource Guide help. Find projects in need of funding, volunteers, donated goods, or partners for a Rotary Foundation Matching Grant on ProjectLINK. Iconic landmarks around the world served as the backdrop for the End Polio Now message the week of 23 February in honor of Rotary's 106th anniversary. They included the Trevi Fountain in Rome; a Lantern Festival gate in Taiwan; the parliament building in The Hague; the globe of the SM Mall of Asia in Manila, Philippines; the Bill & Melinda Gates Foundation headquarters in Seattle, Washington, USA; Byblos Castle in Byblos, Lebanon; and the soccer stadium in Cape Town, South Africa, among others. Rotarians around the world celebrate Rotary’s anniversary, 23 February, as World Understanding and Peace Day. RI President-elect Kalyan Banerjee announced the 2011-12 RI theme, Reach Within to Embrace Humanity, at the International Assembly in San Diego, California, USA, 17 January. On behalf of all of the members of the Rotary Club of Crofton and with their unanimous consent, it is indeed my pleasure to present to you the Rotary “Service Above Self” Award. You have been a close and supportive friend of the Crofton Club for a number of years. When the club almost went out of existence, you willingly gave of your time, attended our meetings, and provided unwavering support and encouragement. Before, during, and after your term as District Governor, you have always taken time to assist us by attending our official and social functions, speaking passionately of the benefits and value of Rotary membership. Your attendance tonight is further evidence of that unwavering support. I am also pleased to advise you that, effective in 2011 and for every year thereafter, the club has chosen to honor you by renaming our annual “Rotarian of the Year Award” the “Raymond E. Streib Rotarian of the Year Award.” This is but a small token of our appreciation and gratitude to you for the service, friendship, and example you have provided to this club. Each year the Crofton Rotary Club helps various areas of need right here in our own community. When disaster strikes, we help around the world as well. Our projects include providing dictionaries to all third graders in Crofton as well as work in Haiti, Kenya, and Brazil. Silent Auction items include local and international art, limited edition sports items and collectibles. Women and men join together through Rotary to be of service to their community and world-wide projects. 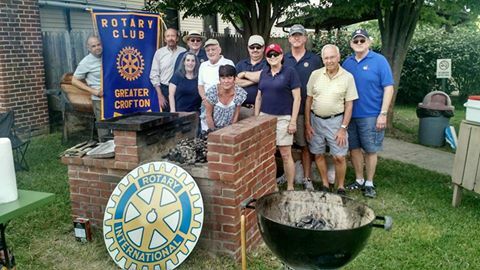 The Crofton Rotary Club has it “roots” in the Bowie-Crofton Rotary Club that started in 1969. Bowie, an established community, and Crofton, a nearby growing new community, provided an opportunity to join in the effort to obtain the required 20 persons to charter a Rotary Club. When the charter was granted, the club met in the evening for dinner, an unusual meeting time as most clubs met for lunch. It worked because both were basically “bed-room” communities. Over the years, the club grew to nearly 50 members. This provided many hands for community service, including roadside litter cleanup and presentation of an annual “Outstanding Service Award” to an employee of businesses with public contact. Membership also provides for fellowship, business contacts, leadership experience and social events. When over half of membership lived in Crofton, it was decided to change the name to the Greater Crofton Rotary Club on April 1, 2001. This indicated that persons within the entire Crofton area are welcomed as members. Later, the meeting time was changed to a breakfast club as if fit the schedule for most members. In 2007, the name was changed to Crofton Rotary as the listing as “Greater” resulted in confusion in all listings of the club. One very rewarding project is the annual distribution of a dictionary to each third grader in Crofton area elementary schools. Another recent major project was to remodel the teachers’ lounge in the Crofton Elementary Schools. Currently, the club sponsors an Interact Club at South River High School. It’s a service club for young people to participate in meaningful service projects, develop leadership skills and provide fellowship. The Rotary motto Service Above Self conveys the humanitarian spirit of Rotary International’s more than 1.2 million members. Strong fellowship among Rotarians and meaningful community and international service projects (like Crofton Rotary’s school project in Brazil) characterize Rotary worldwide. Our main international project has been a daycare in Espirito Santo, Brazil that provides for over 90 children. We have purchased essentials such as food, kitchen supplies and a new water filtration system; currently, we are refurbishing the classrooms and updating the sanitation facilities to give the children a better quality of life. For over 45 years the Crofton Rotary has been there to support and to act as an ambassador for the Crofton community, providing support to areas struck by compelling human need and natural disasters throughout the world. We need your help to continue these good works! On Friday, December 3rd the Crofton Rotary will host its 7th Annual Black and White Ball and Silent Auction at the Blue Dolphin. This is the primary event that supports our philanthropic efforts. We hope you will support his event. For the 6th consecutive year, the Crofton Rotary Club has provided dictionaries to Crofton area third graders. The Rotary Club of Crofton installed its new officers recently at a ceremony held at the Four Seasons Grille in Gambrills. Pictured, left to right, are incoming Club President Frank Newhard, former District Governor Rich Carson, and outgoing Club President Bill Sondervan.